South Australia’s embattled power consumers determined to ditch Jay Weatherill’s Labor government and its maniacal 75% RET. While what follows is a whole lot less certain than outright immediate economic self-annihilation, South Australians aren’t out of the woods, just yet. Indeed, nothing much has really changed, at all. The weather is still the key determinant of whether and how much power gets generated in SA (see above) and, when the wind fails, the price of power goes from an average of around $160 per MWh, all the way to the regulated market cap of $14,000 per MWh. With neighbouring state, Victoria well down the same disastrous path, and others determined to follow, Kerry Schott, the boss of the Energy Security Board has just read the riot act, warning that the current obsession with wind and solar can only end in outright disaster. Electricity retailers will be hit with the cost of keeping the lights on if they fail to meet reliability targets as part of sweeping changes that could also force states with their own clean energy targets to develop more dispatchable power. In a major overhaul proposed as part of the government’s ­National Energy Guarantee, retailers who failed to have enough power for their contracted demand would be “pinged” with the cost of the regulator ­stepping in to buy electricity at sharply higher prices to avoid blackouts. And states that failed to match renewable energy targets with higher amounts of “dispatchable” power, such as hydro-electricity, batteries and gas peaking stations, risked losing government. Kerry Schott, chairman of the federal government’s Energy ­Security Board, told The Australian that states such as Victoria, South Australia and Queensland that had set renewable energy targets of double or more the ­federal renewable energy target would be asked to provide plans for bringing more ready-to-use power into the system. “The penalty is the lights in their states would go out and they would lose the election,” Dr Schott said. “The penalties for the retailers for not having enough power — if they have sold load and haven’t got it — the penalty that we are envisaging they would pay is that cost of the AEMO (Australian Energy Market ­Operator) having to step into the market and buy it, which will be at non-market rates. The proposed penalties for ­retailers would amount to an overhaul of existing arrangements where the cost of the AEMO stepping in to secure more supply is spread across the wholesale market. Electricity prices are capped at $14,000/megawatt hour — 152 times the $92/MWh price in SA early yesterday evening — to limit the financial impact during peak demand or short supply. 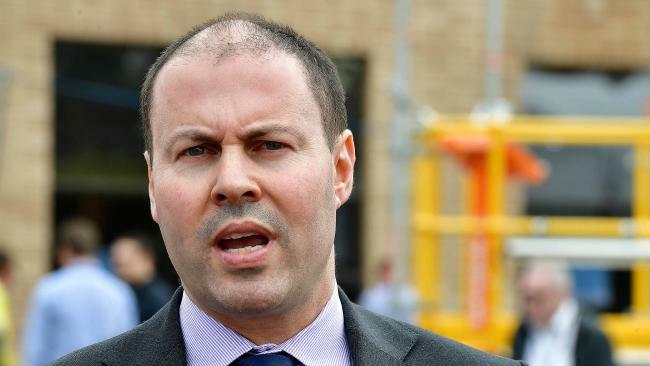 Federal Energy and Environment Minister Josh Frydenberg said last week that already this year prices had been above $5000/MWh on nine occasions in SA and six times in Victoria. States have faced calls from the federal government and business groups to abandon individual ­targets. In a submission to the ESB, the Business Council of ­Australia said state-based targets would undermine the guarantee and drive up electricity prices. But Dr Schott said that while some of the state schemes were more helpful than others, there was nothing “too egregious” in any of them. “It is important that whatever we do allows the states to run schemesthey already have in place,” Dr Schott said. She added that SA, which gets about 50 per cent of its energy from renewable sources and last month lifted its target to 75 per cent, provided a “live case” of the consequences of relying on intermittent power, with $500 million spent to ­develop a battery farm, fund diesel generators and encourage pumped hydro and solar thermal energy. Dr Schott, who was appointed to co-ordinate regulators and ­reform proposals last year after Malcolm Turnbull declared a ­“national energy crisis”, rejected claims the worst had passed and said it remained “a slow burn” caused by the phased closure of old coal plants. Despite new caps on network charges and wholesale electricity futures prices falling after a sharp spike last year caused by the closure of the Hazelwood coal-fired plant in Victoria, Dr Schott said businesses remained at risk unless there was a “stable and descending” path for electricity prices. Earlier, Dr Schott told a Royal Bank of Canada forum in Sydney the industry was going through a period of “mega disruption” as regulators and operators struggled to keep pace with falling costs for renewable but intermittent power technology such as solar panels, coal plant closures and changes to consumer behaviour. More than 100 parties had ­delivered submissions about the NEG and Dr Schott said designing a mechanism for reliability as part of that guarantee had been the most “vexed issue”. The Clean Energy Council, which has criticised the 26-28 per cent emissions reduction target in the NEG as too low, also warned against doubling up on existing measures to improve reliability. “The institution of rule changes and reforms resulting from this process are likely to largely resolve concerns around ensuring a secure and reliable ­energy system as renewable ­energy increases its share of the market, the CEC said. The source of the market chaos troubling Kerry Schott isn’t hard to finger (see above the combined output of every wind turbine connected to the Eastern Grid with a notional capacity of 4675 MW during February). Her solution is the National Energy Guarantee. With Jay Weatherill and his 75% RET consigned of the political dustbin, the National Energy Guarantee is firmly back on the table. Here’s the thrust of it. If the NEG were to be defined by its objective, it would be referred to as a guarantee of ‘No More Blackouts’. The starting point is a ‘worst case’ demand scenario, using forecast electricity consumption, based on past data. The forecast is to take into account seasonal variations in power demand, related to temperature and weather conditions, from which daily demand can be predicted. At the height of summer, a week of +40°C temperatures across a State heralds maximum demand, as businesses and householders crank up their air-conditioners and refrigerators have to work overtime. For example, a state like South Australia, on such a day, requires around 3,000 MW to keep the grid up and running. Plenty of experience of sweltering without power has taught South Australians that, on a hot summer day, wind power is usually delivering nothing much at all. 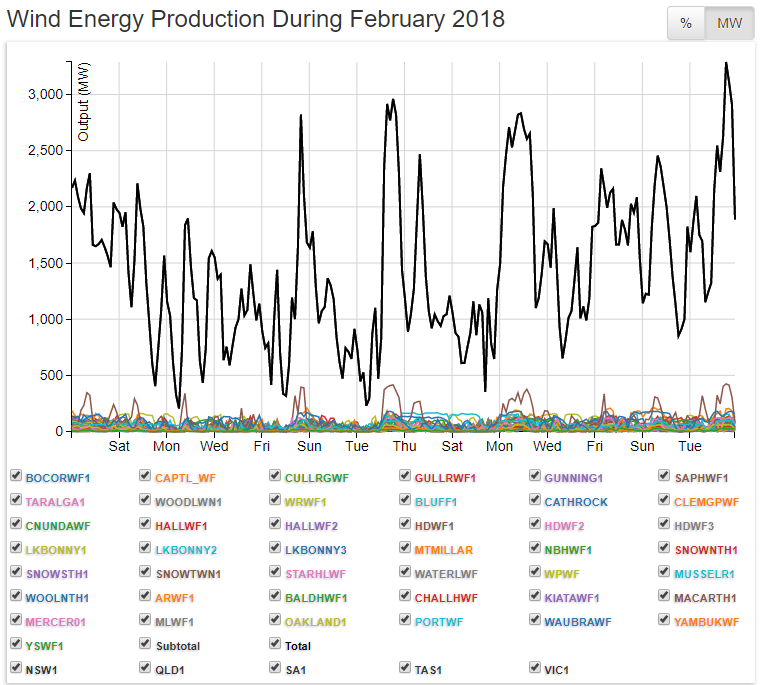 A 1,000 MW collapse in wind power output on 8 February last year, when temperatures hit 42°C and wind power output hit the floor, left 90,000 South Australian households boiling in the dark. Such an event becomes highly unlikely under the NEG. The NEG is designed as a state-based requirement on retailers that, on such a day in SA, will require them to have contracts with generators securing 3,000 MW of dispatchable power. Dispatchable means coal, gas and hydro. All three sources are delivered to South Australia via two interconnectors (Heywood and Murray Link), with a notional combined capacity of around 870 MW. SA has a 1,280 MW gas-steam plant owned by AGL at Torrens Island and a 440 MW Combined Cycle Gas Turbine plant at Pelican Point, owned by Engie (aka GDF Suez). 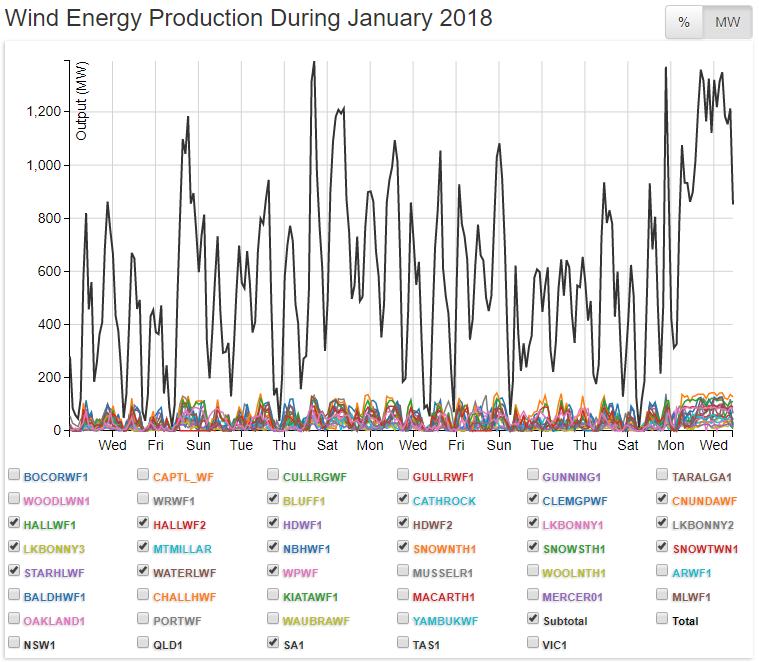 It has a run of OCGT and diesel peaking plants, with another 276 MW of diesel fueled OCGTs that Jay Weatherill fired into action to prevent summertime blackouts and improve his electoral chances. Retailers will need to pick from that selection to meet their NEG obligation. At this point many commentators start talking about mega-batteries but, for now, the grid-scale bulk storage of electricity is in the unicorn and pixie dust realm. Retailer’s NEG obligations are going to be determined on a daily basis by the amount of power they would need to sell to meet their retail customers’ demands, on a worst-case scenario basis: on a scorching SA summer’s day, across all retailers, they will be obliged to have contracted a total of 3,000 MW of dispatchable power. On that scenario, a retailer with a one-third share of the SA market, will need to have contracted to secure 1,000 MW of dispatchable power to meet their NEG obligation. In other words, for every MW a retailer has promised to sell its customers, it will need to have a contract to purchase a MW of dispatchable power to meet that promise. In markets where a commodity is sold forward by its producer to a trader (fixing a price long before it is ready for delivery), the trader covers that purchase with another contract to sell the commodity to a processor or end user at the nominated time for delivery, so that the two contracts operate ‘back-to-back’, and the risk is spread across both. The NEG will result in the same type of market for dispatchable power. In effect, retailers have already promised (and therefore forward sold) power to their retail customers. Under the NEG they will be bound to contract with generators of dispatchable power for the same volume they should expect to deliver to their customers on a worst-case scenario, on any given day. STT’s Canberra operatives tell us that the precise form of the penalties to be applied to retailers who fail to satisfy their NEG obligations is yet to be determined. However, we are reliably informed that it will be a very big stick, indeed. The most likely option, as appears from The Australian article above, is to penalise retailers to the extent they have failed to contract to meet their NEG obligation, by making them liable for the costs incurred by the grid manager in obtaining supply from dispatchable sources. On a worst-case scenario, that will add up to serious money, as peaking power generators can charge the grid manager prices all the way to the market cap of $14,000 per MWh, as noted above. A retailer will not satisfy its NEG obligation by contracting to purchase wind power, principally because, on a worst-case scenario, wind power is simply incapable of being reliably delivered. 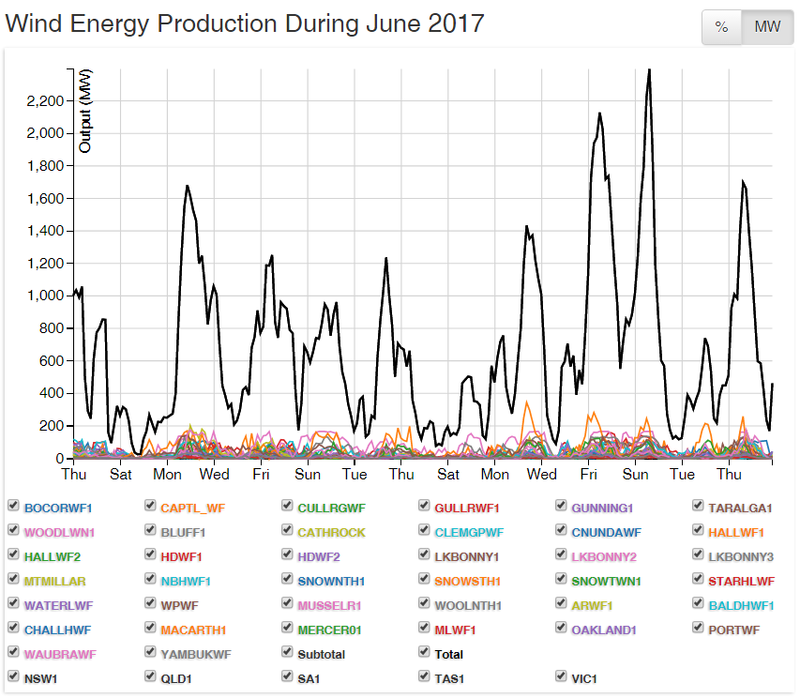 (see above the entire output of every wind turbine connected to the Eastern Grid in June last year). In short, in terms of satisfying the NEG obligation, wind power is absolutely worthless. Which is one reason why the owners of coal-fired power plants are rubbing their hands with glee. AGL might be running a nauseating media campaign about “getting out of coal”, but it’s just decided to throw $200 million at refurbishing its Bayswater coal-powered plant and has absolutely no intention of offloading any of its coal-fired assets. While the likes of Kerry Schott and the AEMC’s Anne Pearson keep blathering on about mega-batteries being used to satisfy retailer’s obligations under the NEG, market economics suggests that their first port of call will be coal-fired power generators. The simple reason: cost, reliability and availability. Apart from a piddling 100 MW battery in SA’s mid-North, there is no system of battery storage in Australia. Whereas, retailers can choose from what’s produced by dozens of coal-fired plant in Victoria (4,880 MW), NSW (10,240 MW) and Queensland (8,390 MW) – with a total capacity of 23,510 MW, delivered day in and day out, whatever the weather, and at a price that their customers can readily afford: in the order of $40-70 per MWh. The dreamers that reckon batteries will lovingly store electricity harnessed by gently caressing the wind or capturing sunbeams, can expect to pay a whole lot more than that. Including the REC subsidy, wind power costs around $110 per MWh delivered to the grid and solar around twice that. Retailers aren’t in business to feel good, they’re in business to make money. Which means that the NEG has just guaranteed the market for cheap, and always available, coal-fired power. With panic stricken regulators, like Kerry Schott alive to the prospects of an entire ‘system black’, as well as the staggering cost associated with attempting to maintain grid stability (let alone satisfying consumer demand), something has to give. In reality, the NEG is a bit like performing CPR on a patient who should be receiving his last rights: without it, the system is absolutely terminal. With minor parties and independents holding the balance of power in both the South Australian Parliament and the Federal Parliament, counting numbers and making deals is the order of the day. Thanks to Australia’s complex and confusing Federal structure, the National Energy Market is the product of (ironically) a piece of South Australian legislation, referred to as the National Electricity Law. And it’s that law that needs to be amended, with the cooperation of the other States, to put the NEG in place. For as long as Jay Weatherill was in power, there was no hope of any such amendment; with Steven Marshall’s Liberals in charge, now there is. While South Australia’s favourite Greek, Nick Xenophon failed to realise a single seat in the lower house (and also lucked out in his own seat of Hartley), his SA Best party managed to secure 2 upper house seats, for Frank Pangallo and Connie Bonaros. As the Liberals will not control the Legislative Council, that pair have now become critical to the future of the NEG. STT hears that the Federal Energy Minister, Josh Frydenberg has been frantically attempting to cut a deal with Nick Xenophon that would help get the NEG off the ground. Xenophon has never been a fan of wind power. So any policy that not only kills the wind industry, but keeps the lights on in his home State, is bound to get his tick of approval. Frydenberg is desperate to avoid the kind of debacle that’s played out in SA from spreading to Victoria, and beyond. The NEG is his last best hope. Whether he’s the man to sell it, is another matter. Frydenberg: desperate to avoid SA’s disaster spreading. I'm sure we'll all be over the moon if Malcolm Turnbull and Josh Frydenberg's grand NEG plan works, but to me it seems unlikely that ever more government regulation and distortion of the NEM will produce anything other than an even more precarious house of cards. It reminds me somewhat of the comments attributed to General Sasabowski in the film A Bridge Too Far when he commented on Field Marshal Montgomery's plan for Operation Market Garden in Holland toward the end of WW2. The more quickly you get on with building cleaner, efficient HELE coal plants, the sooner you can begin to shut down the old clunkers. This has to be a step in the right direction. The trouble with the ‘iME’ generation, is that they are impatient. They want renewables, and they want them now. Well, some issues need to be handled responsibly and Energy is one of them. If you want to use renewable energy and you want it now, then get ‘off the grid’. It can be done, and would seem to make more sense, in some instances, than being connected to it. I recently heard a woman who was interviewed during a power blackout, stating that their solar panels don’t work when the grid goes down! Better to get off the grid entirely and be in control of your own property. It does mean making adjustments to your lifestyle however. I know people who have done this successfully with solar panels and small batteries, plus selected white goods, a gas cylinder powered stove and wood heater. They gave up having their own small wind turbine on the property, as it kept breaking down. That’s the trouble with moving parts! Sadly the couple above were driven out of their ‘off the grid’ home by the industrial wind facility next door. They now live in a home far from turbines, but connected once again to the troublesome SA grid and everything that entails. I understand they would be faced with a disconnection fee, if they were to get ‘off the grid’ once again. Well, that is perhaps an area that should be explored by the government. As for the grid itself, reliability and affordability are the key. Nuclear should also be a part of the mix. And NO, to anymore industrial scale wind turbines. These are destroying rural communities and regional centres, whilst destabilising the grid and pushing up power prices. When the wind drops or blows too hard, they have to be backed up by baseload power. Something has to be there to counter for it. And the wind may drop for days at a time! It’s essential that we commence a real and serious conversation about moving to nuclear powered electricity generation. Emissions free – that should say it all. No emissions for the idiot greens and environmentalists to be constantly whinging about and driving us all nuts. A string of nuclear power stations – government owned, and built and operated to the highest possible standards – would finally give relieve to suffering consumers and massively support all levels of Australian industry. No more huge subsidies for wind and solar power – let these existing dinosaurs life expire (in 25 years time) – just a nuclear fuelled source of electricity that is available 24/7, cheap, sturdy, reliable, and emissions free. We agree and have dozens of posts making the obvious case for nuclear power in Australia. Anne Pearson is clearly a believer in unicorns, the fairy godmother, Santa Claus and the tooth fairy – she has a lot of friends in high places – my fantasy is that they will end up being accountable for their abject failure to deal with reality eg no power from wind farms when there is no wind, no power from large scale solar when the sun is not shining and no way of ever knowing when the planet will deliver the right amount of either wind or sun to make these fraudulent sources of electric power work – plus believing that some time between now and tomorrow there will be some kind of magic way of catching and storing these ethereal bits of electricity for use when it’s needed, surely catching lightning strikes makes more sense! Malcolm Turnbull, Josh Frydenberg and the rest of the wets in the liberal party are currently in power in our federal government – the NEG is not defined, it is not operational, it is another fantasy – the concept it will operate as a ‘solution’ is more fantasy – the only solution is Tony Abbott’s solution ie abolish subsidies for renewables today and build power stations that only produce dispatchable power, the first of which must be funded by government because it is governments that destroyed the system and destroyed the environment for businesses to do it.